A project manager is being sought to oversee the relocation of county council headquarters – three months before such a move is even debated. Councillors have been assured that no decision has been made over the future of County Hall in Loansdean, and a full debate of plans for a move to Ashington is scheduled for July. But already Northumberland County Council is advertising the post of project manager for ‘an exciting change project which will see the council move to a new civic centre’. The post, with an annual salary of up to £47,482, would be fixed term until May 31, 2018. The closing date for applications is Tuesday. 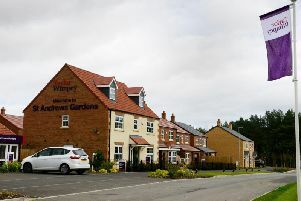 Northumberland Conservative Group Leader Peter Jackson, who has previously slammed the relocation plan as a white elephant, said: “The leader of the council said just the other day in a very public way that the council would have the opportunity to decide this issue on July 1. I would be very interested to hear from the council leader how he thinks he can make this appointment ahead of a promised debate on the County Hall decision on July 1, which is about three months away. “This just confirms to me as an Opposition councillor that the decision has already been made. The council says it is prudent to begin recruitment of a project manager as members have already agreed there will be relocation to Ashington, a new headquarters on the existing site or a re-design of the current building. The post-holder would be expected to deliver the project within a capital budget of around £20million, with the new facility ready to open in 2018. Coun Jackson said he was disappointed, but not surprised by the development. “It was quite clear from the flavour of the consultants’ reports that the decision had been made months ago and that the Labour Administration was hell-bent on moving County Hall to Ashington in a completely unjustified manner,” he said. “It has the potential to cost taxpayers million of pounds. “I didn’t know about this job, but I’m getting used to the way that the council is being run. It is as though it can have the power to do everything behind closed doors without justifying its actions to the public and the taxpayers. Once again it has been found out. A council spokesman said: “Last October the council’s Policy Board considered three options around the future of the council’s headquarters — relocation to Ashington, a new corporate headquarters on the existing site and a substantial re-design of the existing building. “All three options represent a significant project involving substantial relocation and building works, from initial preparation through to implementation, and require experienced and skilled project management.